← Special Announcement: SBAI’s on Facebook! This post comes from guest writer Kirsten Williamson ’13, a Studio Art and Women’s Studies student at the University of Rochester. As a Studio Art major and a Women’s Studies minor, the annual (en)Gendered exhibit allows me to combine these two passions. This art exhibit is put on by the Susan B. Anthony Institute in partnership with the Art & Art History Department here at the University of Rochester, and features work by current undergraduate students. 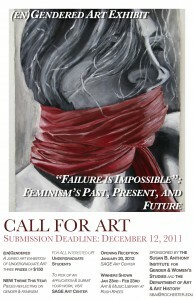 This year there’s a new theme for the show: “Failure is Impossible”: the Past, Present, and Future of Feminism. The idea of exploring topics I’ve studied in Gender & Women’s Studies classes through artistic means is incredibly exciting but at the same time can be slightly daunting. In years past I have had photographs I wanted to submit to (en)Gendered but was scared that my work didn’t fit in with the theme of the show. This year SBAI is accepting submissions on the topics of gender and feminism, which in and of itself is many faceted and has complex connotations. It deals with equality in economic, political, and cultural realms and has ties to healthcare, film, education, psychology, etc. Submissions for this year’s show could deal with: the depiction of the female form, art as activism, and the exploration of gender roles, among other things. And, the more I think about it the more I realize that some of my favorite artists – Kelli Connell, Francesca Woodman, and Anna Gaskell, just to name a few – make work about these very topics. It’s a broad theme is and allows for many interpretations! Any undergraduate student can submit, regardless of major. This is a wonderful opportunity to have your work in a juried show. There is no submission fee and SBAI is open to pieces of all media. Submission forms and drop-off are at Sage Art Center, and the deadline for submitting is December 12th, 2011. I sincerely hope you submit your work to this year’s show! Pick up submission forms and submit work at Sage. Former Program Assistant at the Susan B. Anthony Institute for Gender and Women's Studies at the University of Rochester. 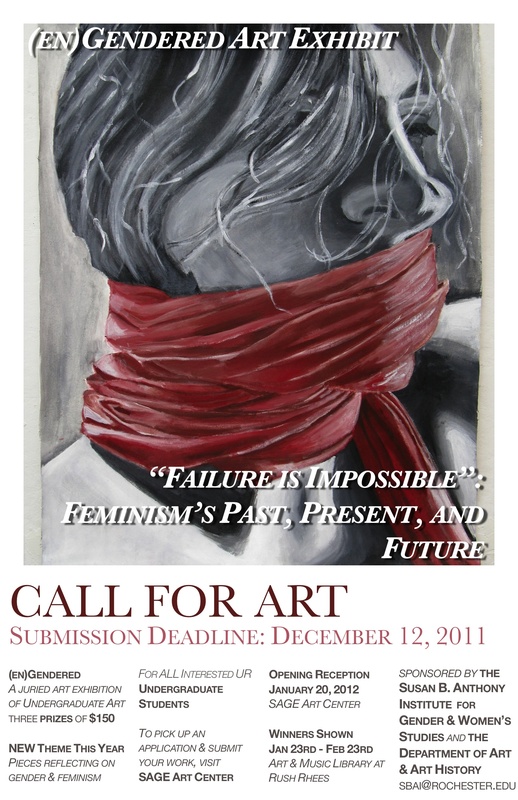 This entry was posted in Announcements, SBAI Events and tagged #(en)gendered, #art, #feminism, #gender, undergraduates. Bookmark the permalink.